Alto & Contralto | downtown, upscale. Experience the best of urban Nashville. Amazing studio, 1- and 2-bedroom condos available in an ideal location for short-term rentals. 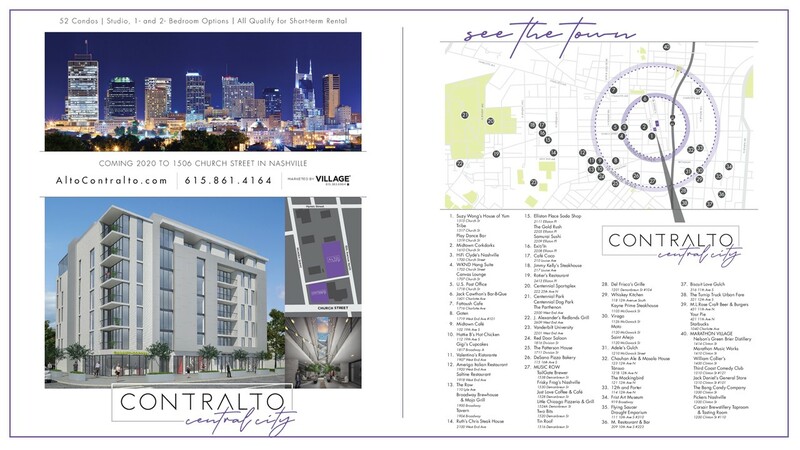 Less than 5 blocks from downtown nightlife and walkable to popular midtown restaurants and entertainment, Alto Contralto is ideal for those looking for a true urban Nashville experience. Contralto | Coming in 2020 | For Sale Now — 7 floors. 52 unique units available for short-term rental. Downtown Views. Upscale amenities. The mixed-use modern building features efficiency condos — perfect for a visiting guest or business traveler. Select from one of our nine unique floorplans — featuring downtown-facing views. Relax like a local in your downtown condo while you enjoy the community’s upscale amenities. Fit in a quick workout before a night on the town in the community fitness center or share cocktails with the girls on the private rooftop terrace. Marketing is underway and a new image has been released for to a proposed seven-story condominium building for which work could start in Midtown in early to mid-2019. To be called Contralto, the building will sit near the intersection of 15th Avenue North and Church Street. It will offer 52 residences starting at $254,000, according to the marketing materials. Of note, Contralto will offer efficiency condos, with the materials referencing the units to be “perfect for a visiting guest or business traveler.” Owners can offer the units as short-term rentals. 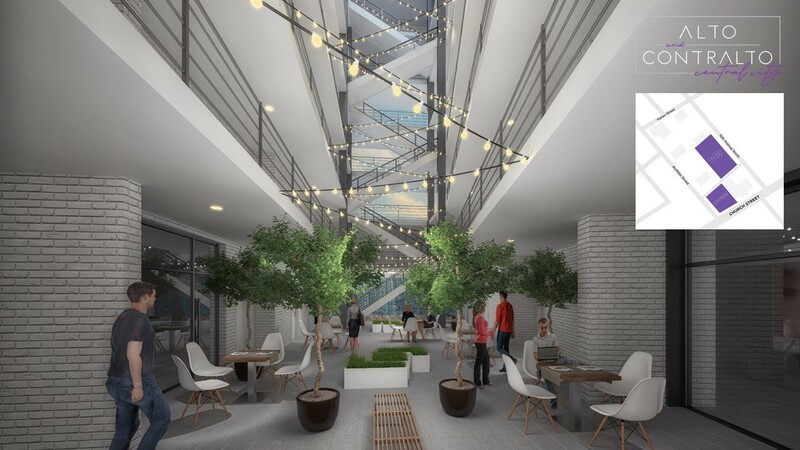 Contralto will have an address of 1506 Church St. and also offer 2,000 square feet of retail space and a seventh-floor amenity space for a fitness center, clubroom and an outdoor rooftop space. Its west side will face McMillin Street. Via 15th & Church Equity Investors, Nashville-based developer Lee Molette has enlisted Village Real Estate Services to handle the marketing and sale of the Contralto units. Village agents Danielle Helling, Deborah Vahle, Shanté Pollard and Robby Stone are overseeing the effort. The team is partnering with Nashville-based Playlist Properties, which will manage the short-term rental properties for the future various unit owners. Helling said 20 of the 52 units are pre-sold. A nondescript structure will need to be razed to accommodate Contralto. Molette plans a second condominium building to join Contralto. It will be located at 215 15th Ave. N. and rise 12 floors (click on View Gallery in the above image to see a rendering). To be called Alto, that building is expected to offer at least 74 owner-occupied condos, Helling said, and will be positioned on an adjacent parcel located catty-corner to Contralto. The lowest-level units in the Alto will be positioned on the fifth floor and sit atop four levels of a parking garage. The building will offer a swimming pool, rooftop amenities, retail space and a fitness center. Collectively, Alto and Contralto will have about 6,000 square feet of commercial space. In music, contralto and alto are defined as the lowest-pitched female singing voices. The Nashville office of Moody Nolan Inc. is serving as the architect for both buildings. R.G. Anderson will be the general contractor, with the Don Hardin Group to handle the role of project manager. Previously, the project was called The Residences @ 15th & Church. Original plans, released in March 2015, showed a seven-story building fronting 15th and a three-story structure facing both Church and McMillin. Those two buildings were to have offered a collective 74 apartments and about 8,000 square feet of commercial space.